Where am I? 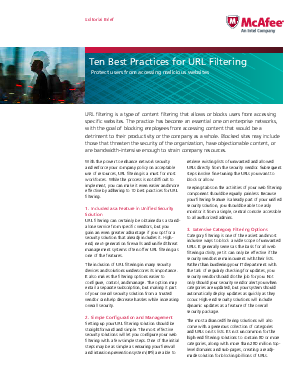 › Home > White Papers > McAfee > 10 Best Practices for URL Filtering for Large Enterprises. URL filtering, which blocks users from accessing websites that are malicious or erode productivity, is an essential security best practice. Discover 10 ways to make this easier and more effective to implement.